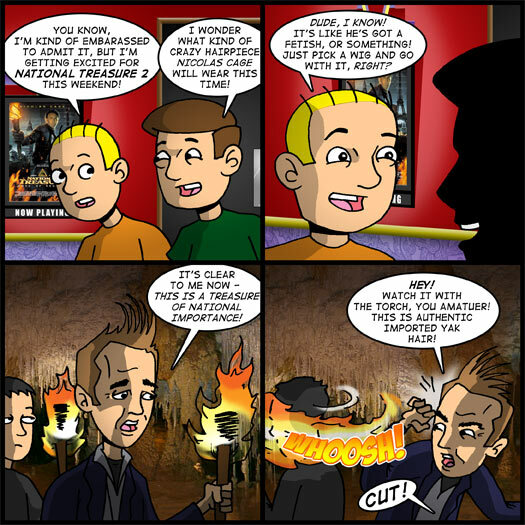 You know, I’m kind of embarrassed to admit it, but I’m getting excited for National Treasure 2 this weekend? I wonder what kind of crazy hairpiece Nicolas Cage will wear this time! Dude, I know! It’s like he’s got a fetish, or something! Just pick a wig and go with it, right? It’s clear to me now – this is a treasure of national importance! Hey! Watch it with the torch, you amateur! This is authentic imported yak hair! Hey, guys. I know this is extraordinarily short notice, but it was one of those happy accidents that just cropped up at the last minute and I wanted to let you know about it. In celebration of National Treasure: Book of Secrets being released in theaters this Friday, Disney has also released a brand new 2-disc collectors edition of National Treasure on DVD this Tuesday, December 18. This thing is loaded to the hilt with features. Four brand new documentary shorts, deleted scenes, an alternate ending and a slew of featurettes that go further behind the scenes! You’ll have a chance to win a copy of your very own by listening to The Triple Feature talkcast tonight at 9:00 PM CST. The last few weeks we’ve been doing call-in trivia contests. I didn’t have enough time to prep any questions this week, so that means we’ll probably do our old standby routine – I drop one half a clue in the broadcast and you come back here on Wednesday for the second half of the clue. Send the completed clue along with your name and e-mail address to theaterhopper@hotmail.com and one winner will be chosen at random! Be sure to dial in and listen to the show live tonight. We’ll be talking about I Am Legend, Atonement, The Kite Runner and the brand new trailer for The Dark Knight!